Ralph Wetzel was born (1917), bred and educated in Illinois. He received his BS (1938) from Western Illinois University, and his MS (1939) and PhD (1949) from the University of Illinois. His dissertation, completed under the advisorship of S. Charles Kendeigh, was entitled “Analysis of Small Mammal Populations in the Deciduous Forest Biome”. In it he tested census methods and conducted analysis of changes in mammal assemblage with forest succession in tracts recovering from stripmining; he quantified seasonal fluctuations in rodent populations; and, he described variability in small mammal assemblage with respect to gradients of moisture and altitude at different scales, i.e. in the Smoky Mountains and in the Eastern United States. Upon completion of his doctoral work he was promptly hired by the University of Connecticut, initially as an instructor (at an annual salary of $3840) then in 1953 as an Assistant Professor. He was awarded tenure in 1954, became Associate Professor in 1959 and Professor in 1966. Also in 1966 he spent a summer as a Specialist for US AID at Osmania University in Hyderabad, India. Beginning in 1969 he regularly took academic year leave to study Venezuelan mammals as a Scientist in Residence at the US Museum of Natural History, and from 1973 to 1977 he was a Research Associate at the Smithsonian University. During this period he spent multiple summers in the field in the Chaco of Paraguay, supported at least in part by the National Geographic Society and the University of Connecticut Research Foundation. There he found alive a species of peccary that had been known only from pre-Hispanic archaeological deposits. How had living pigs that were familiar to the indigenous people of the region evaded (re)discovery? In the publication announcing the discovery (Wetzel et al. 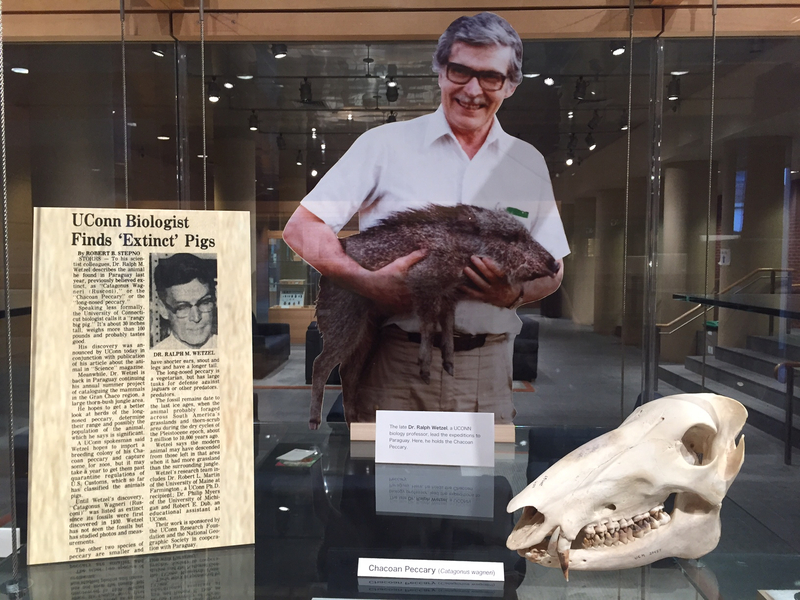 1975), Wetzel remarked: “….we suspect recent peccary skulls often receive cursory examination. In periods of short funds for museum space, skulls as large as those of peccaries are usually viewed as a storage rather than an intellectual problem. Certainly most studies in the past two decades on the evolution and zoogeography of peccaries have been by paleontologists.” His collections are now databased and can be searched on VertNet. Ralph Wetzel served as vice president of the CT Academy of Arts and Sciences. He also chaired a committee that considered whether the University of Connecticut ought to have a medical school. The recommendation of this committee is not known. He retired in 1983 and served as adjunct curator of mammals at the Florida Museum of Natural History at the University of Florida, Gainesville. He passed away in 1984. Wetzel, R. M. and L. R. Penner. 1962. Coydog in Connecticut. Journal of Mammalogy 43: 109-110. Wetzel, R. and J. Lovett. 1974. A collection of mammals from the Chaco of Paraquay. Occasional papers, Biological science series. University of Connecticut 2. Mayer, J. J. and R. M. Wetzel. 1986. Catagonus wagneri. Mammalian Species 259: 1-5. Mayer, J. J. and R. M. Wetzel. 1987. Tayassu pecari. Mammalian Species 293: 1-7. Wetzel, R., A. Gardner, K. Redford, and J. Eisenberg. 2007. Order Cingulata Illiger, 1811. Pages 128-156 in A. Gardner, editor. Mammals of South America. The University of Chicago Press, Chicago.